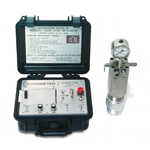 The Model M is a portable dual-channel strip chart recorder that uses acoustics to obtain the distance to the liquid level in the casing annulus of a well. The device consists of a microprocessor controlled dual channel amplifier / recorder and a gun/microphone wellhead attachment. The gas gun generates an acoustic pulse which travels through the wellbore gas. This pulse reflects from tubing collars and the liquid level. The microphone converts acoustic reflections to an electrical signal. The amplifier/recorder simultaneously processes and filters the signal through two channels and records two traces on a paper strip chart. One channel accents collars, and the other channel accents the liquid level.The operator counts the number of collar reflections to the liquid level and multiplies by the average length of the tubing joints to determine the distance to the liquid level. Acoustic velocity can also be used in cases where counting tubing collars is not available. Labeled timing marks simplify the task of determining time to the liquid level reflection. The computerized Well Analyzer is capable of obtaining a complete well analysis with minimal time and effort on the part of the operator, however, the operator must be familiar with the computer and software operations. Echometer offers a variety of training and seminars to help familiarize operators with equipment function and operations. The Model M strip chart instrument is more simple to operate but cannot perform dynamometer measurements, motor power-current analysis and unattended pressure transient data acquisition and analysis and thereby delivers a less complete view of a well's operation. To view the Model M brochure click here.